Hear, hear. Weasels are a pest inNew Zealand and should be treated accordingly. Yes Tim, that is exactly why it is important to know if Dotcom was approached and what his response was. Having said that, it is difficult to ascertain whether he would answer truthfully to the question about whether he was approached, as it may be easier to play the victim if he sticks to the copyright argument rather than the champion of internet privacy line that the Internet Party has embraced as a policy plank. After all, at least in the view of some official circles, one's right to privacy ends when that privacy cloaks criminal activity, especially when that criminal activity involves cross-border murderous conspiracies. Then again, perhaps this is all a product of post 9-11 US government overreach when it comes to defining threats and identifying enemies. If so, and if he was approached by the USG and refused to cooperate, then Dotcom's lawyers have yet another arrow in their quiver. Dot com just looked like an easy target (easier than google ) and perhaps he was just the catalyst for the arrangements being outlined by John Campbell. And why did James Clapper fly in in one of these and not just fly in business class? What was his baggage allowance?. Because you don't get a full suite of secure communications equipment in business class. That plane's connections into the US national security communications network will be on a par with the planes colloquially known as Air Force One (AF1 is the callsign for a USAF plane with POTUS aboard, not for the pair of 747s), and given Clapper's role that's entirely expected. He's still working, and it's a hell of a long time to be totally off-line. Plus, there'll be some very nice accommodation inside that plane; proper beds, showers, etc. He's not a "spy", he's the Director of National Intelligence; the spy master. There's nothing whatsoever covert about his job, so why muck around with commercial flights that put him on someone else's very flexible schedule and take him out of the intelligence loop for a day? OMG! I'm sure I've seen that Airstream in Barbadoes St! I wouldn't wanna be seated (or sleeping) on the side if they were taking evasive action in a hurry... or rolling. Belt and braces. If you read the article Paul linked, the trailer is palletised for air cargo. That means it's run in on tracks and then secured with locking pins. 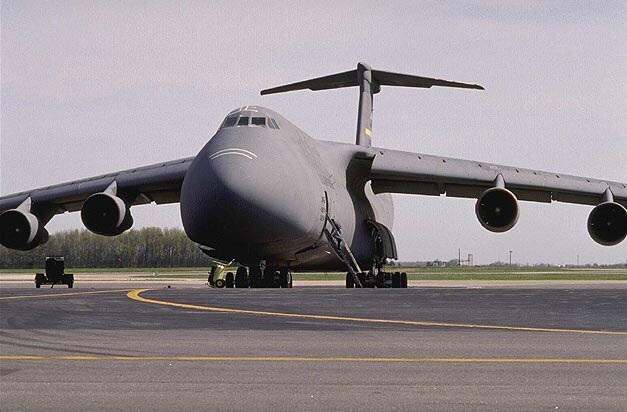 Air forces around the world do pallet-loaded freight all the time, and they know how to keep stuff in place even when doing deliveries into less-than-friendly areas. Kind defeats the purpose unless he bought a lot of other folks with him. I wonder who they were?. OMG! I’m sure I’ve seen that Airstream in Barbadoes St! now I've had time to skim through it. a glimpse inside the power conduits. The consequences of cargo shifting in flight can be utterly catastrophic so there's a lot of attention paid to keeping things completely in their intended place. Where it ends up after it's left the plane, however, is a whole different story. The first aircraft I flew on (aged 3 months) was a Bristol Freighter of British Air Ferries - they operated an aerial car ferry service across the Channel. Apparently it was very loud and drowned out any baby noises. That can't be terribly comfortable. Otherwise described as "Ten thousand rivets flying in close formation" according to a former flatmate. Read the article. Those planes get used for just one or two extremely senior staff, with a large retinue of office staff and technicians (and sometimes media) in tow. Does it actually matter how he got here? Really? It's a decision for the US to make, and it's made that particular decision. It's not anything abnormal or special for Clapper to have come here in that manner. Thank you. Those images are something else. Does it actually matter how he got here? Yes, its the most compelling piece of the jigsaw. If Clapper had come on a Boeing with a diplomatic retinue it would have been spooky business as usual, and something that the New Zealand public can vote on. Formally unannounced in USAF FK-U1, but not caring to hide his presence is heavy handed and militaristic. If Clapper had come on a Boeing with a diplomatic retinue it would have been spooky business as usual, and something that the New Zealand public can vote on. You are a wee bit confused about how senior members of the US establishment travel. They do not use commercial flights. There are whole segments of the US Air Force dedicated solely to transporting Distinguished Visitors (in USAF parlance), including senior members of the intelligence services of which Clapper is the most senior of all. 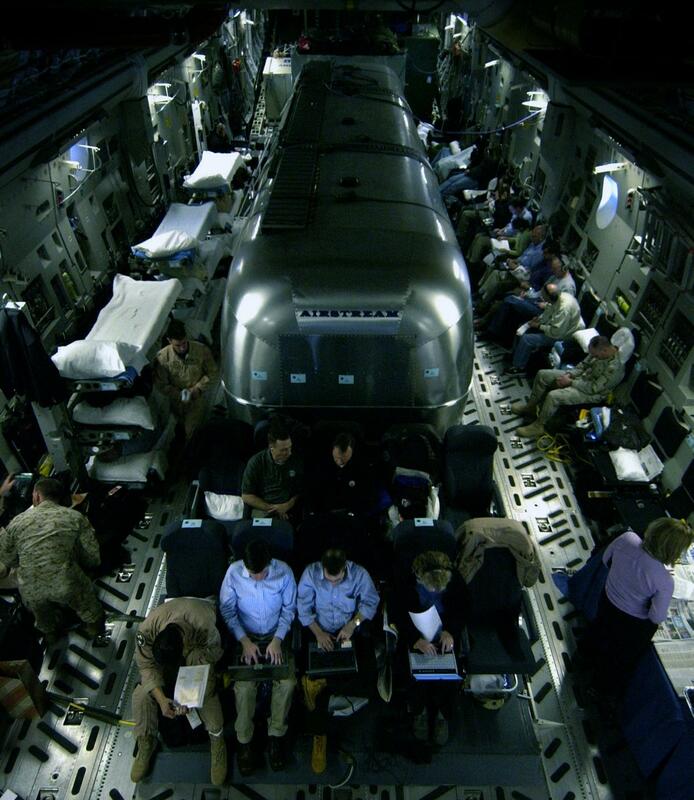 The US does not trust personnel of such seniority to civilian air transport on official international business. It does not happen. They fly about on military aircraft with full communications links to the motherland. Clapper is not a diplomat, either. He’s a very senior spook. They don’t get welcoming parties and bands and a military guard of honour. They arrive, they conduct their business, and they leave again. So much, so normal. If John Kerry arrived in such a manner you could be sure something was up. For the King Spook, though, it’s just what one would expect. It's clear you don't like it, but there is nothing remarkable about how Clapper travelled to NZ. It doesn't make the visit any more or less sinister and clandestine, no matter what music Campbell Live's production team lays over the photographs and videos. I'm assuming the underground tunnel linking Washington and Waihopai must have been closed for maintenance. The current regime has its roots in Bill Clinton’s administration who decided tat America’s future was not in making stuff but in protecting ideas. This has turned out to be an economic falsity but US corporates are now so wedded to the model of extreme IP protection that much of the apparatus of the state (including the NSA and 5 Eyes) is designed to enforce that regime. As people have said up thread, Key does not run the GCSB. However. This government, like most I imagine, has a "no surprises" policy in terms of who knows what and when. If the PM and head of the GCSB knew nothing about the raid on KDC before it happened, I would be very, very, surprised.